Fit Wanderlust Runner: Guess What? I Am Now A Sweat Pink Ambassador! "The Sweat Pink Ambassador community is a place for enthusiastic, positive, inspirational people to connect and support each other in reaching their goals around health, fitness, life... and more. It's a place where we come together and celebrate what we have and reach for even more. It's a place where new friendships spark and running buddies find each other; where you'll always find a cheerleader or a word of advice." Honestly I can't picture my life any other way anymore. I love the feeling of getting a good workout in. I love going out for a run to clear my head. I love being able to lift more than I was able to from my last workout session. I love feeling that euphoria once I cross that finish life. I continue and keep going because I remember how my life was before and I don't want that for myself anymore. I was constantly tired, overweight, unhappy, and plain right miserable. I'm short so even the slightest weight gain is noticeable. After college I had gained 30 pounds and it wasn't pretty. Then I signed up for my first half marathon to motivate myself and the rest is history. If you feel you have what it takes to be a #SweatPink Ambassador then I highly encourage you to apply. The community so far has welcomed me in and I am trilled for what's to come. Are you a Sweat Pink Ambassador? What can I do to be a better cheerleader for you? Congrats on becoming an Ambassador! 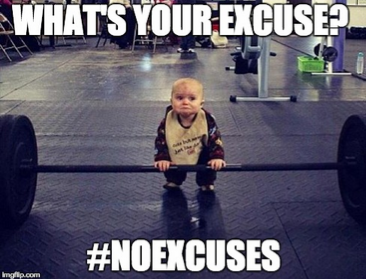 I'm loving the #NoExcuses challenge. I love the motivation and all the participation on social media. Thank you Amy! Yeah the #NoExcuses challenge has been great! I've met some really nice people. A huge congrats!!! And nope - not a Sweat Pink Ambassador! Although, for a time I was an Ambassador of a now defunct Canadian based program called I'm Fit Possible. It's fun to be part of a like minded community! You are amazing parents, and that makes me hopeful.